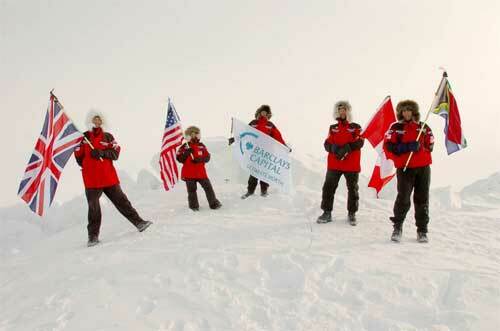 In this image provided by Barclay's Capital the Barclays Capital Ultimate North Expedition Team plants their national flags upon successfully reaching the North Pole, Tuesday, April 26, 2005. The five-person team traveling with huskies and wooden sledges reached the North Pole on Tuesday, completing a 37-day trek that matched the time taken by American explorer Robert E. Peary for the same journey in 1909, according to a Web site tracking the team. From left to right are: George Wells, Matty McNair, Tom Avery, Hugh Dale-Harris and Andrew Gerber.